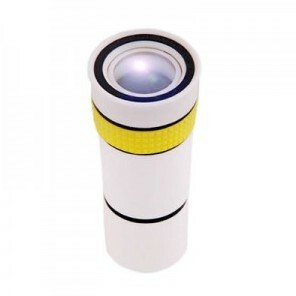 Optical 10x Zoom Cell Phone Telescope w/ Trfor iPod for iPhone 4 -White, Gadget Stop - For all of your phone and Apple needs! If you likes sports outdoor and observing, a telescope is a nice gift. 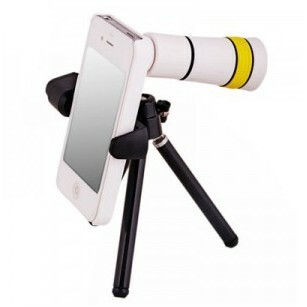 And if you owns an for iPhone 4 cell phone, this telescope must be the perfect gift for you. The new design to run of rays effectively avoids the contection of image, and makes the wide angle, the larger luminous, the higher the visible acuracy. Good for color reduction which makes high quality of photos. It is suitable for those fans who like watching match, concert, travelling and observeing animal, newspaper-man shoots remotely, foresty manages, port dispatcher of the railway, traffic administrative department to collect evidence, public securty organs to enforce the law and collect evidence etc. 1. 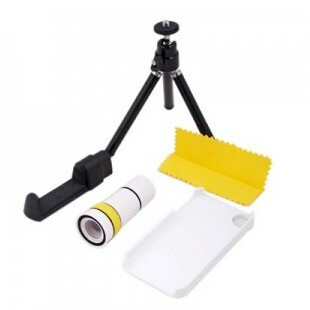 Change the cell-phone back shell first enclosed with the telescope. 2. Adjust the clear focus with your naked eye. 5. Mimimun focus distance: 3m. 1. Compatible for iPhone 4. 2. The new design to run of rays effectively avoid the contection of image, and makes the wide angle, the larger luminous, the higher the visible acuracy. 3. Good for color reduction which makes high quality of photos. 4. 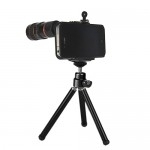 10x optical zoom lens. 5. With trfor ipod, which makes it more convenient to use.